Swimming pool filters filter out dirt and debris from the water. Without a filter, the quality of the swimming pool water will deteriorate rapidly. When installing a pool filter, size does matter. The pump and filter must be properly sized to the volume of the swimming pool. There are three main types of pool filters for swimming pools. They are cartridge, D.E. (Diatomaceous Earth) and sand. However, there are several crucial factors that need to be taken into account before deciding which filter is appropriate for your swimming pool. How the swimming-pool filters work? First, let’s discuss cartridge filters. The cartridge is made from special paper like material and is sized by increasing the height and or the number of pleats. When the water goes through the filter, the paper traps the dirt while the water passes through, Water is sent back into the swimming pool, nice and clean. Cartridges need replacement, typically ever 2-5 years. Cartridge filters are used on spas to large pools. Larger pools require larger cartridge surface areas to accommodate increased volume of the pump. Cartridge filters produce more polished water as compared to sand, but not quite as great as D.E.'s. Sand filters, the water generally flows from top to bottom through the sand. The sand in the filter is a special silica sand prepared especially for swimming pool filters. The sand first traps larger particles and as the filter gets dirtier it traps smaller particles. Sand filters are used on small to extremely large pools. They are easy to maintain and very reasonable to purchase. Sand filters are my personal favorite. DE, stands for diatomaceous earth. DE is a powder of solidified remains of diatoms, a kind of hard-shelled algae. Its rough and coarse texture makes it a great, natural filtration gadget. The DE powder is coated onto grids, the water passes through the DE and through the grid to filter the water. Periodically, when the pressure increases, the DE needs to be replaced. Diatomaceous Earth filters are the most efficient of the three and can filter debris and dirt out to 3-5 microns. DE filters are generally the most expensive to purchase. Pool filter grids within the filter typically last 5-10 years. D.E. Filters are ideal for medium to large in-ground swimming-pools. Once you have determined the size of the filter, choosing the type of filter is more or less a personal preference. MyPool, is a leading supplier of pool supplies offering Hayward Pool Filters to make your pool as clean as it could be. 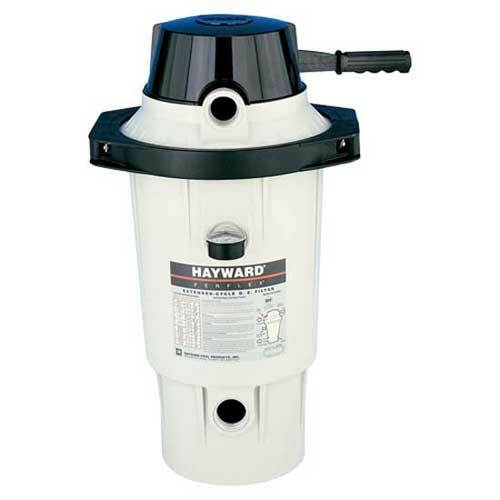 MyPool has Hayward swimming pool filter parts that are not just great in quality but very affordable as well. In fact, at MyPool, you can find everything you require to keep your swimming pool sparkling and clean all summer long.